We don't know how Aaron got into Thomas. It took us quite by surprise and it WASN'T anything to do with him watching him on TV/DVD - that came later... Actually I think it started with his Thomas jacket that I got him back in 2011! When he was young, we visited friends who had a cheap (under £10) wooden train set, and they said their son had played with it for years, so within days I got Aaron one, and it was the beginning of a fascination with trains and tracks that has been consistent ever since. When he is pushing a train around a track he gets very meditative. Do you know how very beautiful it is, seeing a vibrant happy child get meditative and still. It's enabled me to get things done, whilst he is in a calm peaceful trance. I sneak peeks at him and marvel at his concentration. It's not true that 2 year olds can't concentrate. They REALLY can when they are absorbed in a task or a much loved activity! As Aaron's developed and grown, so too has his train collection, and wow, the latest is the best yet, but at his age, requires a lot of parental supervision. Let me count actually... hhhhhmmmm... Aaron has 6 tracks in total. I would say he sometimes has them all out at the same time, but that hasn't happened since we acquired the latest one, thanks be to God. The latest one fills the floor space in the sitting room. 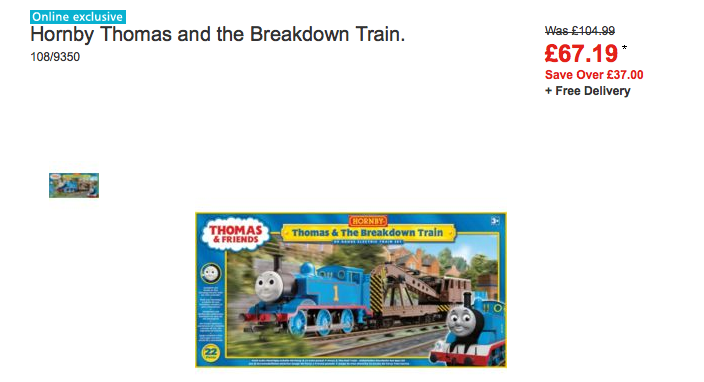 This is it, it's Thomas and The Breakdown Train and is currently £37 off in Argos. Do note, it is a "web exclusive". The day I went to Argos to buy it, I did not realise this, but they were kind enough to process the online order on their tills right there and then, and I got free delivery a couple of days later to my home. LUCKILY thanks to the discount, I was able to get something else as well, which means Aaron and I did have something to take home straight away while we waited the couple of days for the track to be delivered. It was delivered well before Christmas but I wanted us to play with it for a while before reviewing it (that's my excuse and I am sticking to it)! It's a "toy" that is INCREDIBLY good value for money. 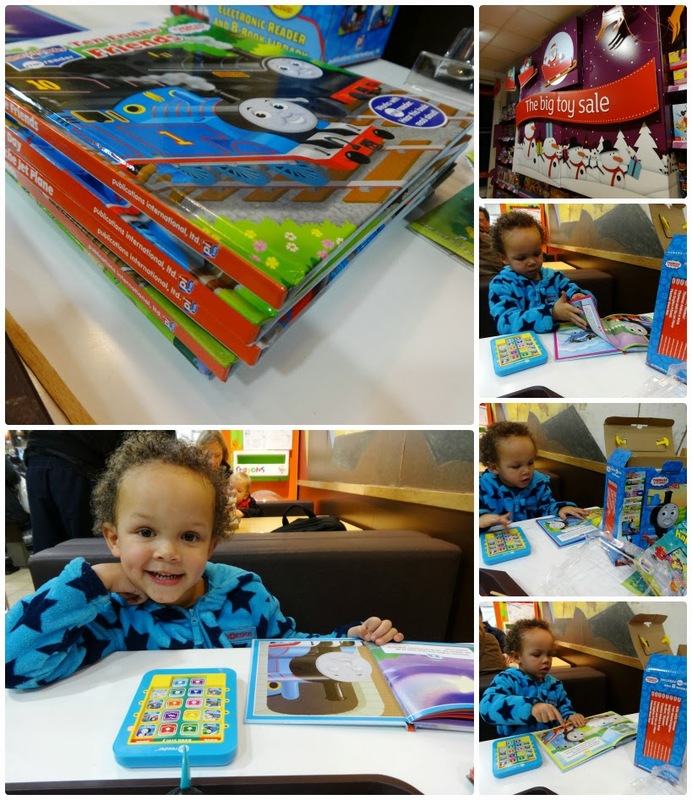 At £19.99 I would pay that just for the books themselves - you get EIGHT hard-back, beautiful Thomas books, and it comes with an electronic reader that Aaron simply loves using. SO impressed was I with this, that on Christmas Eve I went to Argos to get another one, for my (dearly departed) Father-in-Law's best friend's Grandson. Nothing better than gifting a toy that you KNOW works and you KNOW will be much played with/loved! To use it you simply press the button for the corresponding book, and then press a symbol each and everytime you turn a page, for the "reader" to read that page to you. It keeps Aaron busy for ages each time he plays with it. I was really impressed with Argos actually, as that day (when we got the second one, not the first) it wasn't in stock in the Argos we went to, and I put down the items I had collected in the queue and said "if you don't have that I am not buying anything" and she said "you can collect it in a nearby store" and even gave me a receipt so that it would be reserved for me. If you remember the weather on Christmas Eve and the fact that we bus it everywhere (I don't drive) you will know how thankful I was to travel to another branch KNOWING it was reserved for my collection. I think it will require another post to be honest, as there is so much to say... The day I set it up, I felt daunted, as it is our first grown up Hornby, electrical track. Slotting the metal pieces of the track together is a real art form, but I soon got the knack of it. You have to do it so that the are totally seamless and smooth to the touch when connected. After all you are in fact creating a circuit, which gives the trains placed on it a current. That silver line on the wheels chugs round and round and round. Beautiful to watch as it zips and whizzes round the track, effortlessly once positioned correctly. The remote control means that Thomas can go fast or slow or anything in between. He can even go forwards and backwards. There is a lever (I think it's called "points") so that he can go into the sidings. He has proper metal things on his wheels that go round and round (unlike all the childlike Thomas trains we've had up to now), and it now makes sense of that action adults make with their arms when they're going chooo chooo (LOL)! That video will also show you the many bits you get in this set! You get hours of satisfaction from playing with this set. You don't manually push the trains round a wooden track, but it is meditative to watch it speed round. It's a real eye opener getting your first Hornby track actually. Electrics are no problem as EVERYTIME something odd happened and Thomas derailed or Aaron did something silly, the electrics on the track cut out. I'd then have to reset it by plugging it out and back on again, which did get a little testing, so I was kind of wishing Aaron was a bit older. It definitely requires parental supervision. I desperately need to keep it safe so it is still in one piece when he is older. It's already been boxed away, as he kept running across it the other day, and the track is really delicate and can crack if stood on. I have promised him I will get it out again. Daddy was relieved when I put it away as it was taking up the whole sitting room floor for over a week. I can't wait till we move house and maybe it can have a permanent home! The carriages are very delicate, so the hook on the crane has already snapped off. This is more to do with Aaron's age (3.5 years) than the toy itself. I did see it happen so have kept it in a safe place waiting to get the superglue out. Resetting the electrics each time something happened got a little trying. The website photo is only of the box and should show you the track and parts you get. The track mat you get with it is paper and I expected it to be fabric. Because Aaron walked across it a couple of times and dropped things on it a couple of times, it does already have a few tears. On a positive note, it does mean that the track and trains work perfectly on our carpet; you don't require a wooden floor/tiles. With the last point in mind, I would love a LARGE (it would have to be very large) table, so that we could get a really good look at the trains as they go round. Placing Thomas on correctly, (so he picks up the electrical charge/current and moves) is easy, but not so with the other "carriages" as they have many wheels and in dim lighting it was hard for me to align these all to the track. If the track was at eye level (on a table) this would be much easier. But then the chap on the You Tube video makes it look dead easy so maybe for some it is. I think you can already tell from everything I have said that this track takes up a lot of space. Argos' website states: "Space required 1.57m x 1.14m". The box says age 3+, but Argos says on their site: "For ages 7 years and over". Having played with it for over a week, I definitely think Aaron is too young for it, but equally, I think he would fully be responsible for it way before the age of 7, but perhaps no younger than say 5! Good on Argos though for knowing it needed a higher age than stated on Hornby's box! If you are a parent or relative of a slightly older Thomas fan, and all of the Thomas toys seem too childlike, then THIS TRACK would make the perfect gift, or if you have a husband/partner who is as much of a train enthusiast as your little one, then it is IDEAL FOR 3 YEAR OLDS with full on ADULT SUPERVISION! Disclosure: this post was In Association With Argos, but all words and all opinions are my own. Our remote control Thomas is from Argos if you mean the big engine that drives around. I think I got that nearly 2 years ago for about £29 or something. He still loves it. The Hornby set is RC. Make sure you keep all the boxes. The Thomas Stuff has a great resale value too! Mine love Thomas too! Actually my 5 year old now says he is too old for thomas (quite sad, as he loved him before!!) but my others are still in full on thomas obsession and i think my 5 yr would still be very interested in the hornby track! I think I will be VERY sad if he outgrows it. I should say if and when. Mine all went through Thomas phases, the girls too - much love for the trains! F has a total love of trains and is a complete Thomas nut so he would love this! I think all boys get into Thomas somewhere along the line don't they. I have to confess I am not a fan and am glad mine has grown out of it now! This takes me back ! My son is nearly 17 now but he was OBSESSED with Thomas the tank engine. I remembering him not wanting to fly his Thomas kite when he was 3 as he was worried it would break. my kids (girl and boy) love them! Im sure your next baby will do it too. Boys just love Thomas, Son loved the trains and had loads of track and also loved the books. The one thing he wouldn't watch though was the DVD, he hated Diesel, he'd run out of the room. My two used to love Thomas - they're too old now though but I remember how many we used to have! My son used to love Thomas and had several train sets, just like your son. He also loved the Thomas stories which I found really dull to read, but any book they're interested in is great! Boys and Thomas. T loved Thomas before he'd seen him on TV too. Like you it was some clothing we bought. From then on we have progressed to 9000 miles off track and about 20 trains. If the Hornby set is too delicate go for the Thomas Trackmaster stuff, a lot more robust, the trains are battery powered. They usually have good deals on starter sets at Tesco and Argos, and once you have the track you can get some good deals on trains on eBay. Happy Thomasing! Oh I can set up a track with my eyes closed now. Even our really large wooden £84 one. 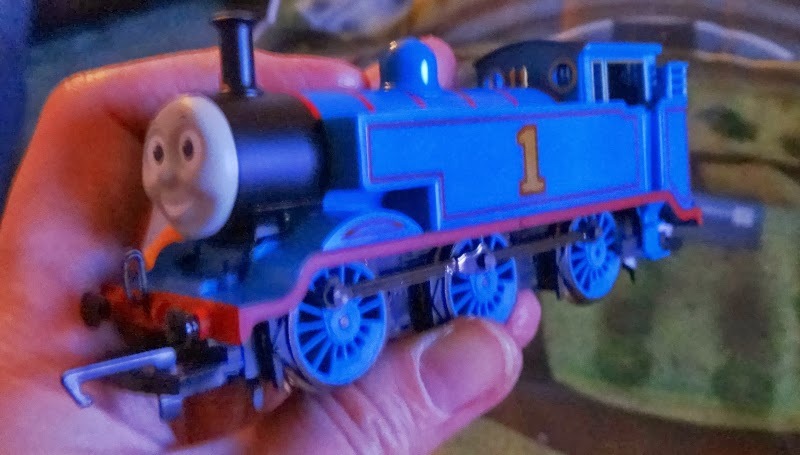 JD was a huge Thomas fan when he was younger. The set sounds amazing. My boys are all just growing out of this stuff and I'm so reluctant to get rid because of the sheer cost of it all. Sounds like you got some fantastic bargains. My eldest loved Thomas and his train track got passed his 3 siblings. Quite sad that my youngest has no interest in it, it's Sponge Bob or nothing for her! We are Thomas lovers here also, my son has been fascinated by trains from when he was about 1 I think. I love the look of the reader and it does seem good value for all the books. I'm on the look out for some reasonable thomas trains that will fit on his wooden train set. I think ebay will be the way to go as they are just so pricey.